Update (Sep 4, 2013) - the online renew page has been disabled, the immigration department didn't post when it will be up. Note 1: this post is applicable to Malaysian only. Note 2: online renew only applicable to Malaysian that already have a passport. If you never have a Malaysian passport before, you still have to go to the office. Wow, this is one of the things that I tried before my physical friends (all my FB friends are real person, ahem). I have been asking around at office these few days, no one actually have renew their Malaysian Passport online before. Most of them still go through the counters and only a few of them used the kiosk at the Immigration Office for renewing their Malaysian Passport. Therefore I want to share my experience on renewing Malaysian Passport online. 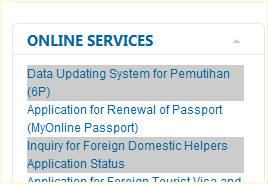 Scroll down to the column on right hand side to look for "Application for Renewal of Passport (MyOnline Passport), click on it which will bring up a new tab/windows (browser/windows settings dependent). Since the website has been updated, ignore the first picture, focus on 2nd and 3rd pictures. On the menu right below the title, move your mouse over "ONLINE SERVICE" or "PERKHIDMATAN ATAS TALIAN", click on "MyOnline Passport". Make sure you understand all the requirements and click "Agree" button at bottom of the page. Choose the category for above or under 18 years old, then fill-in your existing passport and Malaysian IC (identity) number. Passport type and IC category will be automatically detected by the website. Proceed to payment. If I still remember correctly, Bank Islam pages will pop up and you can fill in your credit card number. The credit card payment processing may take a while, be patient and do not click "back" button on your browser. Print the receipt and bring along to the office to pick up your new passport. According to snapshot above, I can pick up the new passport at exact 2 hours after the payment go through. Go to the branch that you selected after that stated time in the receipt. That's it, my experience with Renew Malaysian Passport Online. Hope this post can help you to go through the process of renewing your Malaysian Passport. Update: 20/2/2013 - Jabatan Imigresen's website has been updated, I am putting new pictures on where to access the online renew system. source: This is my personal experience! @Clementony, if I not mistaken, for renewing online, your passport has to be a few months before it expire. If it is already expire, you have to go to the immigration office to renew it. Yes, I know this is very inconvenient for those people with passport already expired, but this is their policy, we have to live with it for now. do we have to attach our IC copy or passport photo thorugh online renewal? any document copies needed? Do we hve to attach any documents through online renewal? like IC? Passprt pic? Hi I'm living in the UAE and originally from Penang. Need to renew my passport, but what category of passport type should I select in the droplist? - Semenanjung or Internal? Would you have any advise/idea? @Andrew Joachim, select Semenanjung. However, if you are at UEA, I wonder how do you collect your passport? What Name to Call Your Next Android Phone? How Much Is Your new iPad? new iPad3 A5X Processor - bigger is better? Angry Birds Space is finally here!